This past week I had the opportunity to visit the lovely town of Oriental North Carolina to shoot another episode of The Kayak Fishing Show. Joining me on this trip were Brooks Beatty, from Jackson Kayak and Bobby Brewer a local who helped us set up the visit. Oriental is a quaint little town with a lot of character, filled with small shops and restaurants like the Silos, which is actually in a Silo. The town has a love of festivals, dragons and all outdoor activities. For paddlers there are many choices of water to hit and for fishermen there are lots of species to target. For kayak fishermen it is ripe with possibilities. 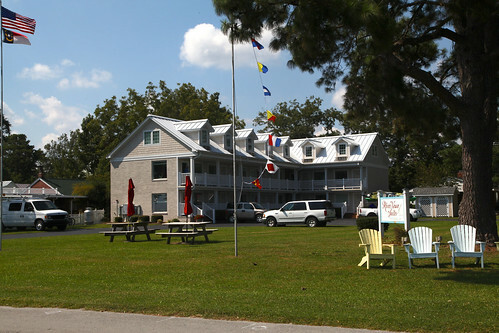 We were lucky enough to stay at the River Neuse Suites Hotel with rooms more reminiscent to a apartment than a hotel room. On our first morning on the water we hooked up with Captain Ashley King of Keep Casting Charters, unfortunately we were greeted by high winds which kept us from being able to target the Old Drum known to live here. Fortunately Ashley had a plan B that would get us out of the wind and get us on fish. We moved from the bigger water to a nice protected spot out of the wind. This spot was gorgeous and had us fishing all around cypress trees covered in moss. Ashley promised us a good top water bite on Stripers and it didn’t take long until we had our first fish. The Jackson Cuda 14 is a great stand up platform, at least for those more comfortable standing than I, and I got to see Brooks get the first fish while standing up tossing a Zara Spook and walking the dog. I discovered that I am not that good at standing and casting and even worse at walking the dog while seated. Because of my lack of coordination I switched to a lure I knew I could work properly and just hoped that it would do the job. My lure of choice was a Sebile Splasher and it wasn’t long before my lure choice paid off with huge surface blow ups and many hookups. Seeing my success Brooks switched to another lure which caused an equal amount of surface disturbance and noise and began to see the same great results. Many fish were hooked, landed and released that day and we can’t thank Captain Ashley for having such a great backup plan. The next morning we stayed on shore to do some shooting around town and did an evening session chasing the big Red Drum. This time we hooked up with Capt. Mitchell Blake of Fish IBX. Captain Blake got us all rigged with Popping Corks, which are the hot ticket for the reds. We worked as hard as we could up until dark but we had to battle the wind all evening and just not found the fish. At least we got a good sunset. With only one day of fishing left on the trip we got an early start to the next day, hitting the water just as the sun rose. For our final day we met up with Captain Dave Stewart of Knee Deep Custom Charters. Dave set us up with DOA deadly combination popping corks, which by this point my arm was getting a bit tired of popping. We reached the fishing spot to find grease calm waters and bait popping, which got all our hopes up. Unfortunately for me the only thing biting were Blue fish which just bit my soft plastics in half. It didn’t take long though for Bobby to get on a real nice Red Drum, which gave him a great ride. It seemed like we were going to get on the fish as all the signs were right, but I think maybe fifteen minutes after Bobby landed that fish someone turned on the wind machine and we spent the rest of the day trying to battle or hide from the wind. Later in the evening as things calmed a bit Brooks hooked a good fish which he got to the side of the kayak but lost before landing so no photos were taken. At the point of being on the water about twelve hours I finally hooked what felt like a good fish which towed me around a bit but as luck would have it the hooked pulled. I know that given some better conditions we would have really put the hurt on a lot of fish, but this is fishing and you have to take what you are given. Even with the tough conditions we caught fish and had a wonderful time in Oriental. Every single person we met or dealt with on this trip were absolutely awesome and I wouldn’t hesitate to visit again given the chance. A huge thanks goes out to all the people in Oriental for helping us put this trip together and particularly Bobby Brewer for handling all the logistics. If you would like to visit Oriental I highly recommend the guides and locations that helped us out. 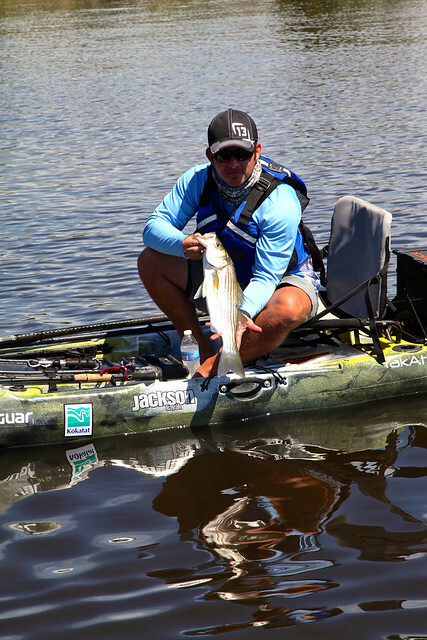 Do you own/use inflatable fishing kayaks ? I’m curious what is your feeling on hard shelled versus inflatables.